June 11, 2013 – Los Angeles, CA – The Screen Actors Guild Foundation hosted its 4th Annual Los Angeles Golf Classic, a major fundraiser benefiting the SAG Foundation’s Catastrophic Health Fund and Emergency Services Assistance Programs, on June 10, 2013 in Burbank, CA. 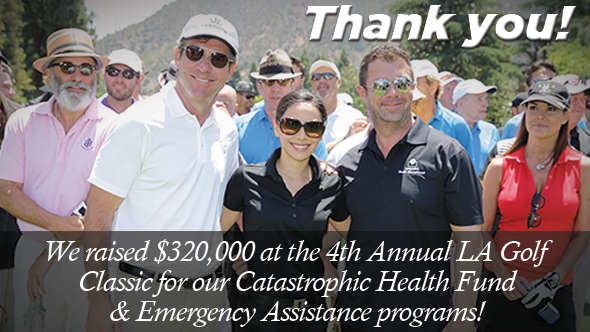 Hosted by Dennis Quaid and Aimee Garcia, the event brought together celebrities and executives from the entertainment industry to raise over $320,000 for performers facing life-threatening illness and severe economic hardship. Celebrities including Tim Allen, Gabriel Aubry, Benjamin Bratt, Peter Gallagher, Andy Garcia, Mark-Paul Gosselaar, Ioan Gruffudd, Richard Karn, CS Lee, George Lopez, Danny Masterson, Breckin Meyer, Dermot Mulroney, Ron Perlman, Joe Pesci, Ray Romano, Kevin Sorbo, Patrick Warburton, Tom Welling and Scott Wolf, teed off for the cause, among others.